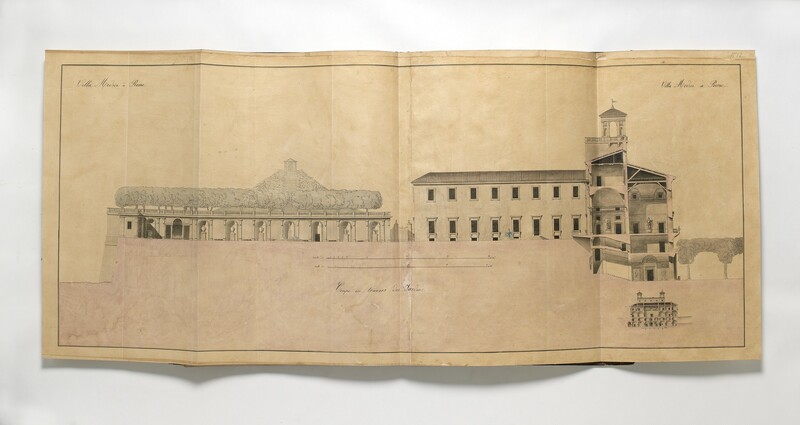 Plans Coupes et Elevations de l’Ancien et du Nouveau Palais de l’Académie de Françe pour l’Etude des Beaux arts, à Rome, par les Artistes pensionnaires du Roi qui ont remporté, à l’Académie des beaux arts de l’Institut de Françe à Paris, les 1ers grands Prix en Peinture historique, Peinture de Paysage, Sculpture, Architecture, Composition Musicale, et enfin en Gravure en taille douce, en Médailles et en pierres fines [rule] L’Ancien Palais, rüe du Cours, Le Nouveau Palais, à la Villa Medici. [rule] Le tout, d’après les dessins Originaux levés Mesurés rapportés et déssinés sur les Lieux par M.M. Norry, père et fils Architectes. et Mr Vandemputte, jeune, architecte, pensionnaire du Roi en 1817. [rule] Rome. 1817.
folio (binding 550 × 405 mm), (1) manuscript half-title, Villa Medici (2) manuscript title, transcribed above (3–14) twelve, unnumbered architectural drawings (eleven double-page and one folding), executed in pen and ink and wash, on tracing paper laid down on thin card (see list below). paper (half-title:) watermark Horne | 1824; (title and drawing:) large watermark of a crowned lion with sword and countermark J Kool & Comp; (drawings:) large watermark of an imperial eagle and countermark LL (? ); (binder’s endpapers:) large shield incorporating a fleur-de-lys and charged with initial M.
Tear in drawing 11 (without loss, early repair), other small defects; generally in fine, fresh state of preservation. binding contemporary blue calf-backed marbled boards, back decorated in gilt and lettered Villa Medici | 1817 (backstrip relaid on new leather). 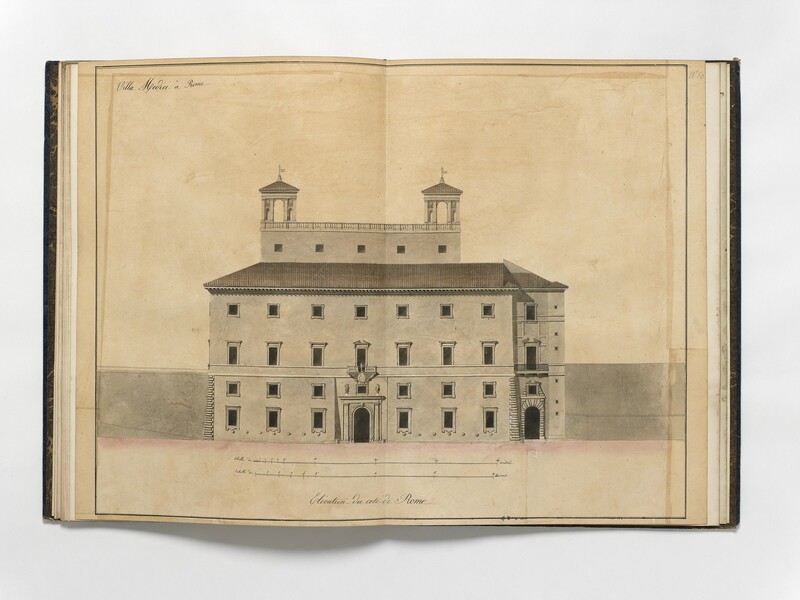 An album of architectural drawings of the Palazzo Mancini and the Villa Medici, successive homes of the Académie de France in Rome. 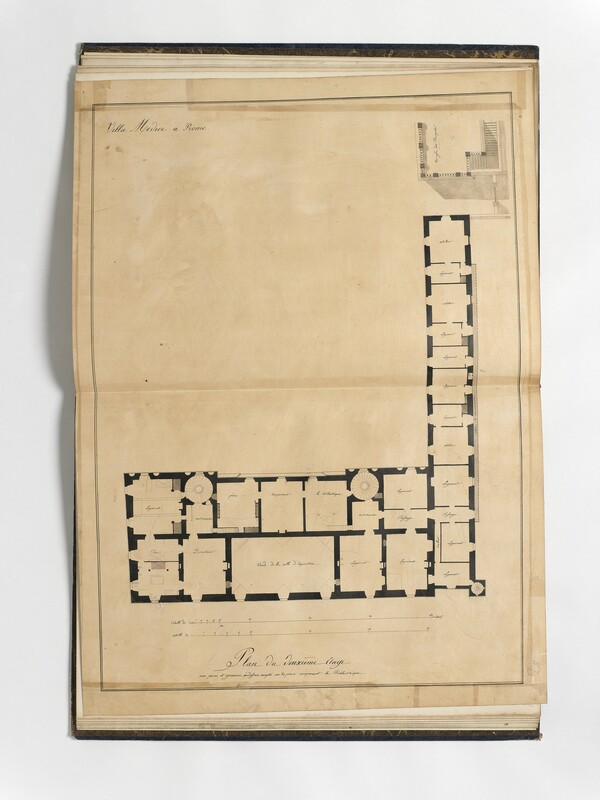 The first two draw­ings are plans of the ground floor and top floor of Palazzo Mancini, indicating respectively the instructional rooms and the lodgings of the pensionnaires, as implemented in 1784. In 1793, the Academy departed Palazzo Mancini, and was homeless until relocated in 1803 in the Villa Medici. 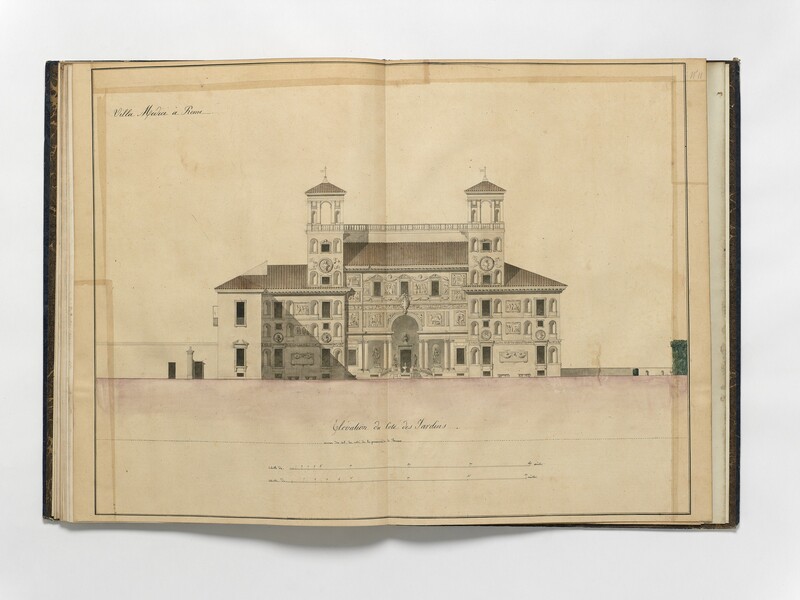 The remaining ten drawings are plans, sections, and elevations of the Villa Medici, constituting a survey undertaken in 1817 by the architect Charles Norry, assisted apparently by his elder son and pupil, Charles-Désiré Norry (1796–1818), and by Lucien-Tyrté Van Cleemputte (1795–1871), who had won the previous Grand Prix for Architecture (1816). Charles Norry had trained in the studio of Charles de Wailly, and afterwards collaborated with him on projects both at home and abroad; in 1779–1782, while De Wailly worked in The Netherlands, Norry was Inspecteur des Travaux during construction of the Théâtre de l’Odéon in Paris.1 He then made a voyage to Italy, where he met Séroux d’Agincourt, and became a supplier of drawings for the embryonic ‘Histoire de l’Art par les Monumens’.2 On returning from Italy, Norry’s practice developed steadily, despite the disruption of the Revolution. A founder member of the Institut d’Égypte, he was one of four architects on the Egyptian expedition, charged specifically with designing barracks, hospitals, and a gunpowder factory.3 In 1803, he became a membre titulaire of the Conseil des Bâtiments civils, and later was appointed by the Ministère de l’Interieur as Chef du Bureau des Bâtiments civils. The Villa Medici had fallen into a poor state before its occupation by the Académie de France. 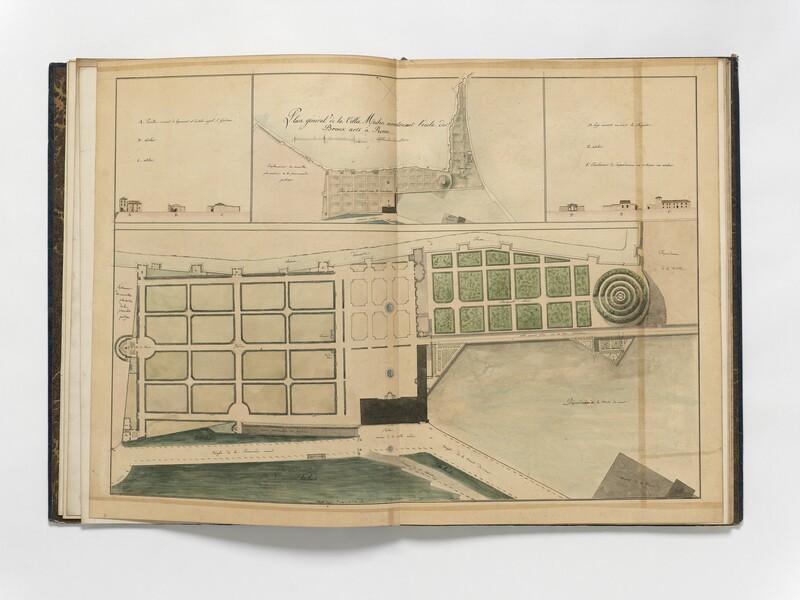 In 1803, the new director of the French Academy, Joseph-Benoît Suvée, ordered the architect Grandjean de Montigny to draw plans of the building, and these had been submitted to Napoleon together with a detailed report on its potential utilisation and an estimate of the cost of remodelling.7 In 1803, an Italian architect was instructed to proceed with the conversion. Building work continued for nine months: windows were lowered to admit more light, interior partitions were erected, doors were opened, and other doors closed, and the gardens were replanted and ornamented by an ensemble of antique statues, reliefs, and other artefacts. For comparative purposes, Norry included in his survey two drawings showing how the Academy had been accommodated in Palazzo Mancini. 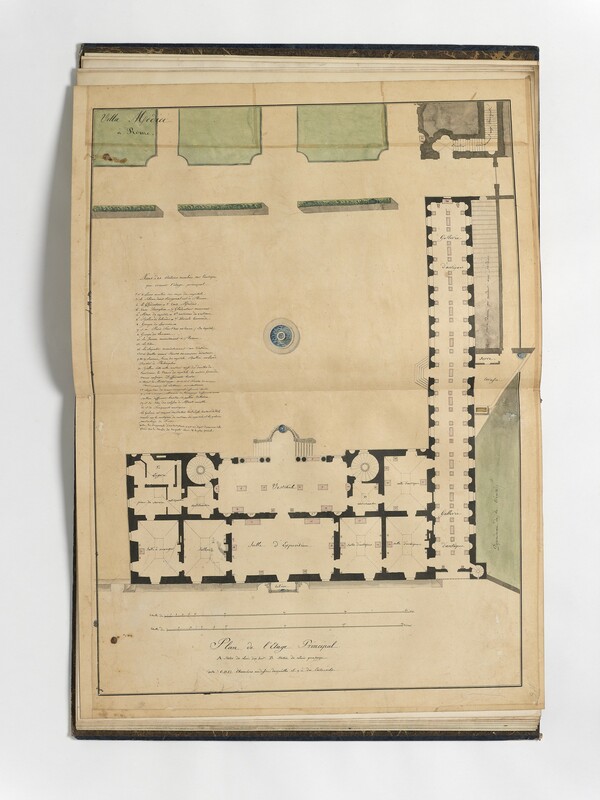 The first is a plan of the ground floor, indicating the principal rooms used for instruction: the ‘Salle à manger’ (refectory, where geometry was taught), the ‘Académie [du nud] d’hiver’ and ‘Académie d’Eté’ (halls for studying and copying models), and the ‘Salle de Marc-Aurèle’. The second sheet shows the lodging of the pensionnaires on the third floor (twelve bedrooms, with the position of the bed indicated in each; a ‘Salle Commune’; and ‘Latrines’). 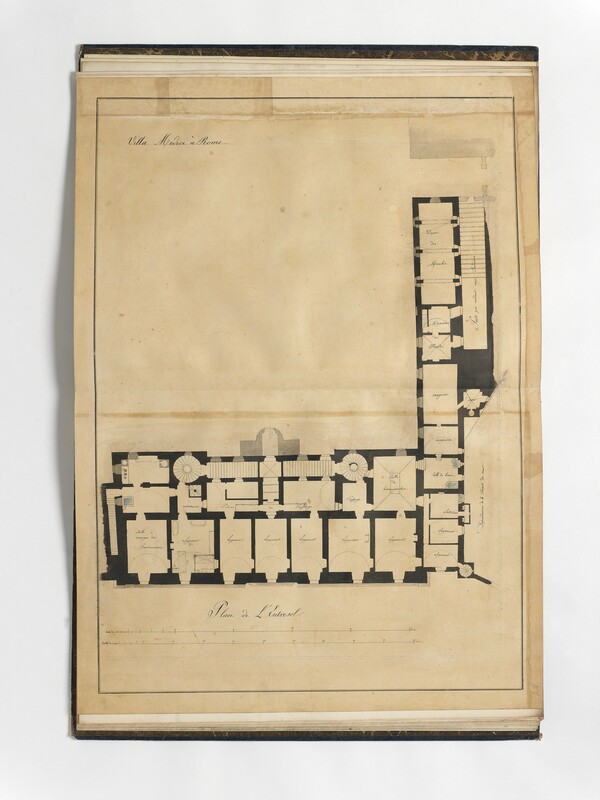 Both plans are dated 1784. 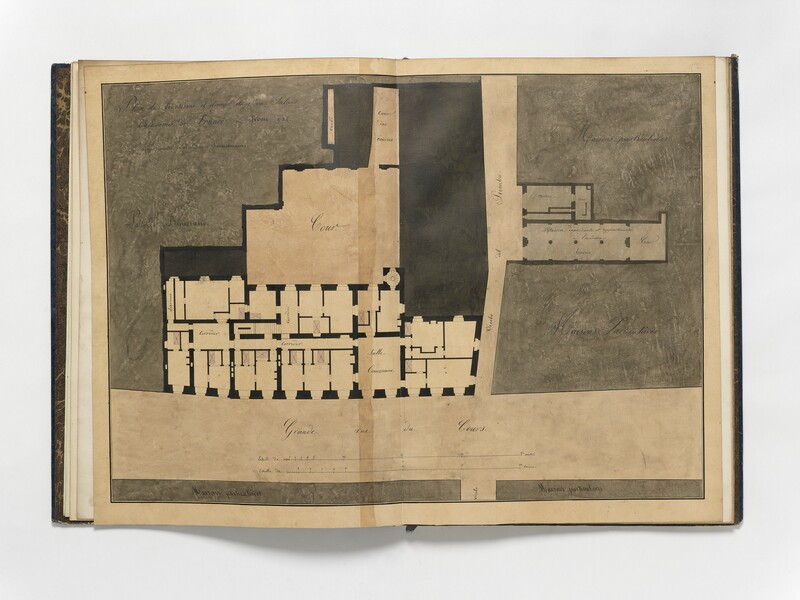 They may be copies of plans drawn by Joseph Subleyras (1745–1810), an architect attached to the Academy;11 or based on plans drawn in August 1775 by Jean-Augustin Renard.12 It is conceivable that Norry made them in Rome, from originals in the library of the Académie de France; more likely, however, they were copied by him later, in Paris. As announced in the manuscript title, the drawings in our album are copies, ‘Le tout, d’après les dessins Originaux levés Mesurés rapportés et déssinés sur les Lieux par M.M. Norry, père et fils Architectes. et Mr Vandemputte, jeune, architecte, pensionnaire du Roi en 1817’. 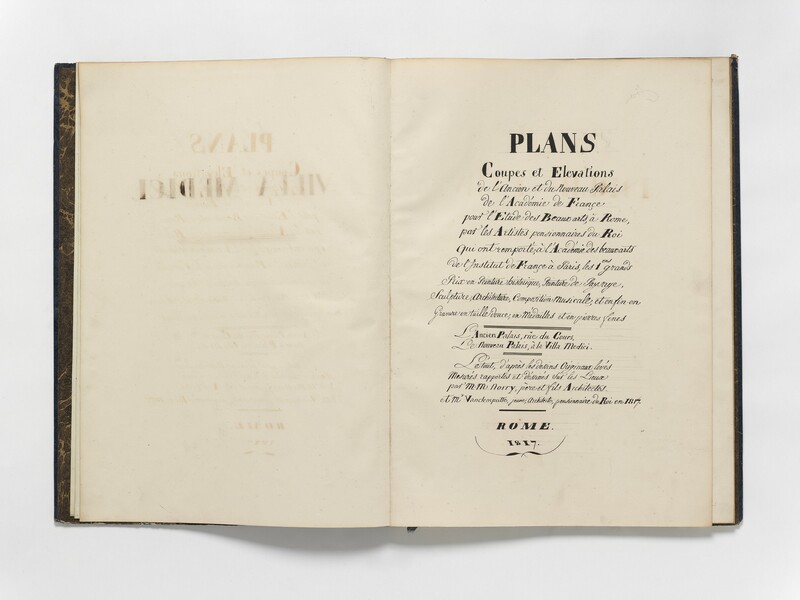 The originals, some of which are signed by Norry, were presented to Lainé in 1818, and are now in the Bibliothèque de l’Institut de France.17 Our copies were produced by laboriously tracing the original drawings onto a translucent support of tracing paper. The tracings must have been done immediately, before submission of the original drawings to the Academy in 1818. Several years later, the thin sheets were laid on card, and assembled as an album by a bookbinder. The manuscript half-title (Villa Medici) is a sheet of paper watermarked 1824, the terminus post quem for production of the album. The copies probably were made by or at the behest of Charles Norry, as a record of his work, even perhaps as a memorial of his late son (Charles-Désire died in Paris, 27 September 1818). 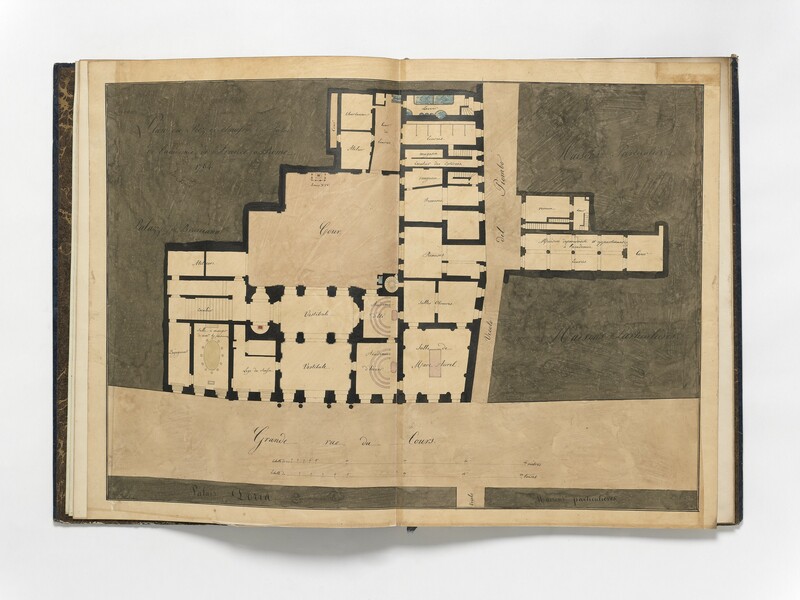 Several drawings have additions in graphite, as for example the ‘Plan du deuxième Étage’, where the placement of furniture in the ‘Logement du Directeur’ and in the ‘Bibliothèque’ is indicated, and the ‘Plan de L’Entresol’ where the furniture in a student’s ‘Logement’ is shown. Unlike the originals, all of the copies have scale bars (in mètres and toises). Alternatively, the copies may have been made by Lucien-Tyrté Van Cleemputte, as testi­mony to his involvement in the project. 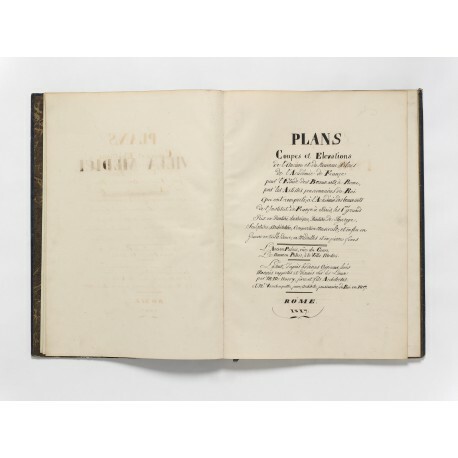 It may be significant that the phrase ‘et Mr Vandemputte, jeune, architecte, pensionnaire du Roi en 1817’ appears on the manuscript title in this volume, but not in the original set of drawings. Van Cleemputte returned to Paris in June 1822.18 In 1824 he exhibited a number of drawings he had made in Rome. ■ Plan du Rez de chaussée du Palais | de l’académie de France à Rome. | 1784. Original: Paris, Institut de France, Ms 1033. Toulier, op. cit., pp.180, 182 no. 187d (51 × 70 cm). Maestà di Roma, op. cit., p.50 fig. 3. ■ Villa Medici à Rome | Plan du Quatrième Etage. ■ Villa Medici à Rome | Elévation du cote de Rome. 1. H. Lemonnier, Notes biographiques sur Charles Norry et sur Moreau le jeune (Paris [n.d.; c. 1860]), pp.3–14; Charles de Wailly: peintre architecte dans l’Europe des lumières, catalogue of an exhibition held in the Hôtel de Sully, Paris, 23 April–1 July 1979, edited by Monique Mosser (Paris 1979), p.102. A plan drawn by Norry in 1781 of the area between Oberneustadt and the Residenzschloß Kassel is Staatliche Museen Kassel, Graphische Sammlung, L GS 13821 (http://lineamenta.biblhertz.it; link). 2. The preparatory materials gathered by Seroux d’Agincourt for his great work were bequeathed to the Biblioteca Apostolica Vaticana (Ms Lat 9839–9849, 13479–13480). Norry’s contribution includes plans of monuments in Benevento, Perugia, and Rimini (Henri Loyrette, ‘Séroux d’Agincourt et les origines de l’histoire de l’art médiéval’ in Revue de l’art, 48, 1980, pp.43, 51 note 26, 53 note 70; Valerio Ascani, ‘La documentazione grafica inedita sul duomo di Benevento nella raccolta di Séroux d’Agincourt’ in Arte medievale, 3, no. 2, 1989, pp.149, 152 note 37). Among other drawings executed by Norry in Italy are a ‘Vue des Thermes de Dioclétien à Rome’ (Private Collection, Paris; Charles de Wailly: peintre architecte, op. cit., p.114 no. 28 and reproduction p.29) and a pen and wash drawing in the Stammbuch von Brack dated 22 July 1784 (In Erlesen gestiftet: die Stiftung der Gebrüder Linel in der Buchkunst- und Graphiksammlung des Museums für Kunsthandwerk Frankfurt am Main, 5. Dezember 1991 bis 16. Februar 1992, Frankfurt am Main 1991, pp.154, 159). 3. Norry published an account of his experiences as Relation de l’expédition d’Égypte (Paris 1799; English translation, London 1800) and also wrote a play, ‘L’Entrée des Français au Kaire’ (Paris 1830). He was an early member of a pseudo-Egyptian secret society, the Ordre Sacré des Sophisiens, founded in 1801; see Darius A. Spieth, Napoleon’s sorcerers: the Sophisians (Newark, de 2007), pp.56, 154. 4. Catalogue général des manuscrits des bibliothèques publiques de France, Paris: Bibliothèque de l’Arsenal, by Henry Martin (Paris 1892), vi, p.303 no. 6648 f.103: ‘Lettre de [vicomte Joseph Henri Joachim] Lainé, ministre de l’interieur, à Norry relative à une demande de gratification pour son fils, étudiant en Italie’ (31 January 1817). Charles-Désiré evidently arrived in Rome before Easter 1817, as he is recorded in the Stato delle Anime, parish of S. Lorenzo in Lucina, in 1817 (Hans Naef, Die Bildniszeichnungen von J.-A.-D. Ingres, Bern 1978, ii, p.232). 5. Charles Norry: Naef, op. cit., ii, pp.229–233 (‘Die Architekten Charles und Charles-Désiré Norry’); iv, pp.400–401 no. 215, signed, inscribed Par Son très respectueux serviteur Ingres, à Madame Norry. The drawing was offered by Sotheby’s, ‘Revolution in Art’, New York, 24 January 2002, lot 96 (ex-William S. Paley Collection). 6. Charles-Désiré Norry: Naef, op. cit., ii, pp.229–233; iv, pp.402–403 no. 216, signed, inscribed, and dated at lower left Ingres à Mr. Norry | Pere. | rome | 1817. The drawing is in the Morgan Library & Museum in New York; see European drawings 1375–1825, compiled by Cara Dufour Denison and Helen B. Mules (New York 1981) p.130 no. 121, and French master drawings: from the Pierpont Morgan Library, by Cara Dufour Denison, catalogue of an exhibition held at the Musée du Louvre, Paris, 1 June–30 August 1993 (New York 1993), pp.226–227 no. 103. 7. Glenn M. Andres, The Villa Medici in Rome (New York & London 1976), i, pp.472–474. Grandjean de Montigny’s drawings are lost. 8. La Villa Médicis, 1: Documentation et description, by Bernard Toulier (Rome 1989), p.72: ‘Après quelque temps, ils entreprennent ensemble le relevé. La mise au net est effectuée sur place. Ce sont les premiers relevés réellement fiables de la villa’. We have been unable to consult a ‘Notice sur le relevé de la ville Médicis par Charles Norry’ by A.L.T. Vaudoyer, presented to the Académie des Beaux-arts in 1846 by his son, the architect Léon Vaudoyer, and now Bibliothèque de l’Institut de France, Ms 1034 (Procès-verbaux de l’Académie des Beaux-arts: 1845–1849, edited by Sybille Bellamy-Brown, Paris 2008, pp.185–186; Catalogue géné­ral des manuscrits des bibliothèques publiques de France, Paris: Bibliothèque de l’Institut [de France], by Marcel Bouteron and Jean Camille Tremblot, Paris 1928, p.230 no. 1034). 9. Martin, op. cit., vi, p.303 no. 6648 f.103: ‘Lettre du ministère de l’intérieur [J.L.J. 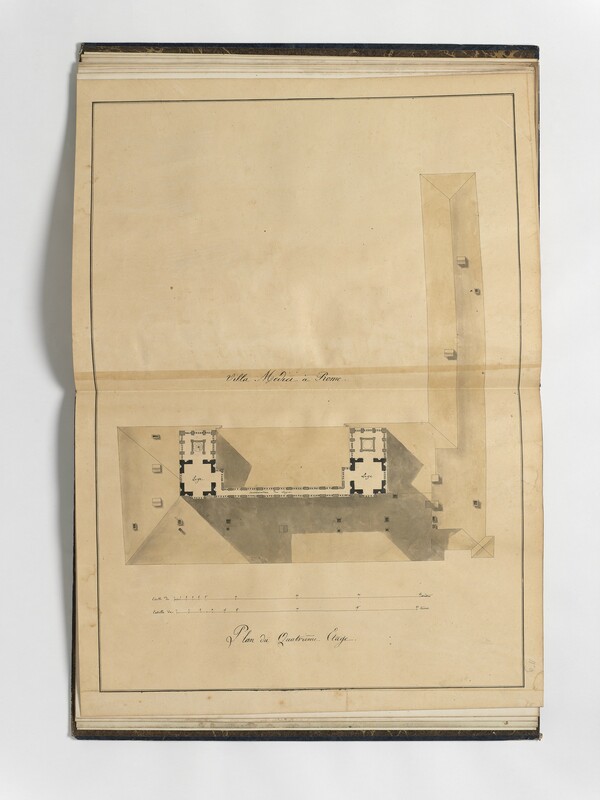 Lainé] relative aux plans de la villa Médicis présentés par Norry’ (6 March 1818); ‘Lettre du ministre Lainé accusant à Norry réception de ses plans de la villa Médicis et accordant une gratification à le son fils’ (20 April 1818). See also ‘Correspondance des directeurs de l’Académie de France à Rome, Tome troisième: Directorat de Charles Thévenin (1816–1822)’, edited by François Fossier’, p.209 no. 163 (link). 10. Lainé acknowledged receipt of this list in a letter to Thévenin on 27 March 1818 (‘Correspondance des directeurs de l’Académie de France à Rome, Tome troisième: Directorat de Charles Thévenin’, op. cit., p.209 no. 163). See also Lettres adressées au Baron François Gérard, peintre d’histoire, par les artistes et les per­sonnages célèbres de son temps (third edition, Paris 1888), i, p.274 (letter of Thévenin, 5 March 1819): ‘J’ai appelé l’attention du ministre sur cette pénurie et j’ai remis à M. Norry, lorsqu’il vint à Rome à la fin de 1817, une note des ouvrages qui nous seraient le plus nécessaires. Elle doit donc se trouver dans les bureaux, ainsi que les plans détaillés de la villa Médicis et ses dépendan­ces, levés dans le même temps par cet architecte’. 11. 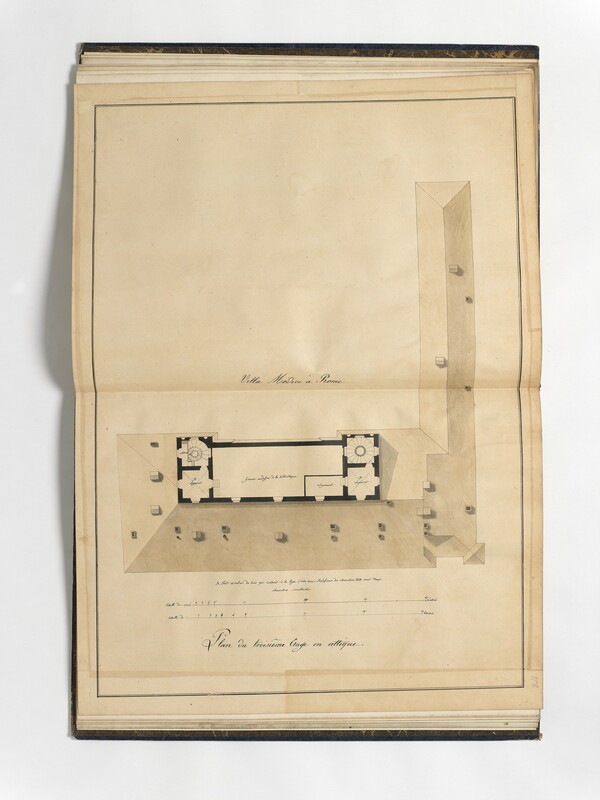 No set of drawings by Subleyras of ‘1784’ has been identified; however, in 1788 Subleyras prepa­red an ‘État des réparations les plus nécessaires à faire dans le palais de l’Académie de France à Rome’ for which there may be associated plans (Correspondance des directeurs de l’Académie de France à Rome avec les surintendants des bâtiments, Paris 1887–1908, xv, pp.227–230). 12. Paris, Institut national d’histoire de l’art, Ms 673: ‘Plan de l’Académie Royale de Peinture Sculpture Architecture entretenue à Rome par sa Majesté, ordonné par Monsieur le comte d’Angiviller, directeur général des bâtimens du Roy sous la direction de M.r Hallé peintre et professeur de la d.te Académie. Levées en Aoust 1775 par Renard Arch.te Pens.re du Roy’ (each drawing 410 × 295 mm). 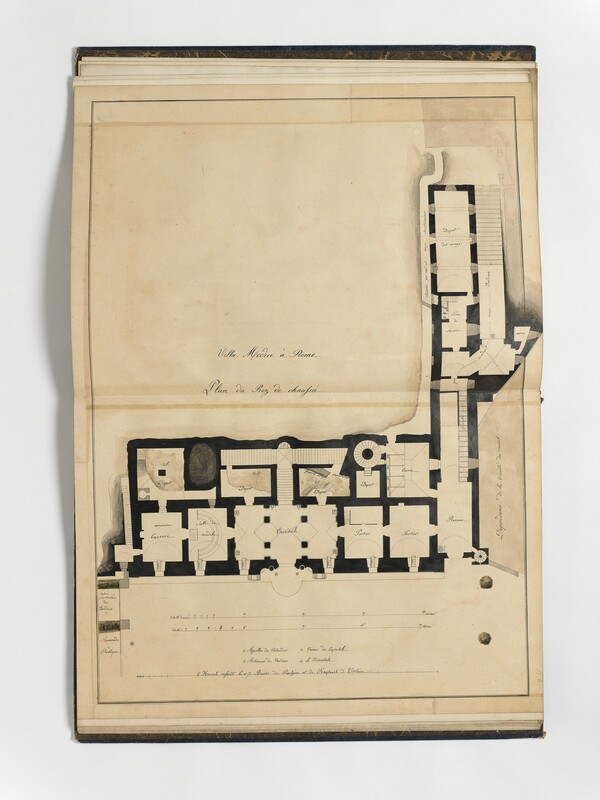 Proposed alterations indicated on Renard’s plan of the Rez-de-chaussée (an entry from the vestibule into the Loge du Suisse; alterations to rooms facing the courtyard to provide a Lavoir, Ecurie, Magasin, etc.) are shown as accomplished on Norry’s plan. A manuscript note on the title identifies the drawings in Paris as copies: ‘Ces plans sont doubles à l’Académie de Rome et conformes aux lettres alphabéti­ques qui sont à chacun de ces plans pour servir à l’intelligence des changemens ou dispositions qui en seront ordonnées par Monsieur le directeur général’ (link). 13. Toulier, op. cit., p.176 no. 187a, comments on the evidential value of this drawing: ‘Le dessin très minutieux nous révèle des détails inédits aujourd’hui disparus: la limite du tuf sous l’escalier avec le retour du mur de la citerne, l’existence d’un passage souterrain (actuellement bouché et muré) le long des fondations depuis l’escalier sud, l’emplacement précis de la rampe d’accès le long de l’ancien jeu de paume (reconverti en galerie des creux), l’existence près de ce dépôt des moules d’une pièce de service avec un cagnard/cheminée, etc’. 14. Toulier, op. cit., p.176 no. 187c: ‘Avec un soin méticuleux, Norry a relevé l’emplacement et la désigna­tion de chacune des sculptures et de chaque moulage (provenant essentiellement du Vatican, du Capitole ou des collections privées romaines). A l’exception des appartements nord réservés au direc­teur, l’étage est devenu lui-même une vaste galerie de sculptures où sont mêlés les dieux du Panthéon et les rois de France, au milieu des bustes des anciens directeurs et des statues faites par d’anciens pensionnaires. A noter la séparation avec les fragments d’architecture qui sont relégués dans la loggia du bosco. Norry pousse l’exactitude jusqu’à dessiner dans l’épaisseur des murs tous les conduits de cheminée de l’étage’. 15. Toulier, op. cit., p.114 no.107, Elévation du côté de Rome: ‘En dessous du balcon, Norry a dessiné les armes de France nouvellement installées. La fenêtre du niveau 5 de la galerie a été abaissée entre 1807 et 1817’. Toulier, op. cit., p.183 nos.188a–b, Coupe en travers des Jardins: ‘Dans la grande salle, la statue de Louis xiv est surmontée d’une inscription’. 16. Toulier, op. cit., p.140 no.143, Elévation du côté des jardins: ‘Quelques copies ou moulages de statues ont déjà été replacées dans la loggia et dans les niches, mais toutes les niches en forme de médaillon furent-elles vraiment décorées de bustes? Le profil de la passerelle de l’étage de la galerie apparaît sur le côté sud. La fenêtre de l’étage du pignon de la galerie a été agrandie, comme celle de la façade opposée, au moment des travaux d’installation de l’académie, vers 1805–1810…’. 17. Paris, Bibliothèque de l’Institut de France, Ms 1033; see Bouteron and Tremblot, op. cit., p.229 no. 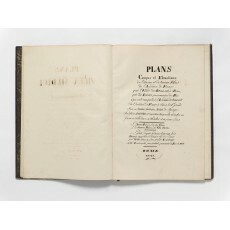 1033: ‘Plans, coupes et élévations de la Ville Médicis, maintenant École Royale des Beaux-arts à Rome, relevés et dessinés fin de 1817, par Norry’ (21 folios, 530 × 390 mm, ‘Demi-reliure’). (http://www.calames.abes.fr/pub/#details?id=IF2B10868; link). For reproductions, see Toulier, op. cit., nos. 43, 107, 143, 187a–f, 188a–b, 212, 224. 18. Italia antiqua: Envois de Rome des architectes français en Italie et dans le monde méditerranéen aux xixe et xxe siècles, catalogue of an exhibition, École nationale supérieure des beaux-arts, Paris, 12 February–21 April 2002 (Paris 2002), pp.45–56.